Chet Womack is probably good with parrots, Im just not keen on his methods (positive reinforcement is good, but im not keen on the flooding bit of it) or his massive adverts and sales pitches. Feel like he is showing you a training video of 30 mins and 20 of them is his speech of how good he is, lol. Thanks! Yeah I`ve got the clicker, but she needs to get the point when I click she`ll get the treat. But the thing is she doesn`t want the treat!!! Everything is too hard and she can`t break it. Don`t you know some treats which are softer and parrots like them? I`ve tried to put some pics, where we have her at home (the pics from my gallery are only from her breeder) but it`s some error there so I`ll try tomorrow. Good softer treats for clicker training are things like garlic sticks, nuts, even things like the Animalzone fruit pellets which are a healthy treat! You can also use things like pieces of dried fruit. It`s just a case of seeing what she likes most. they do tend to get most of there fluids from there fresh fruit and veg, my lot tend to play in there water more than drink it, just make shaw there is always fresh water there for her. Awwww Scarlett, I was just reading your "MEET THE STAFF" on your website... 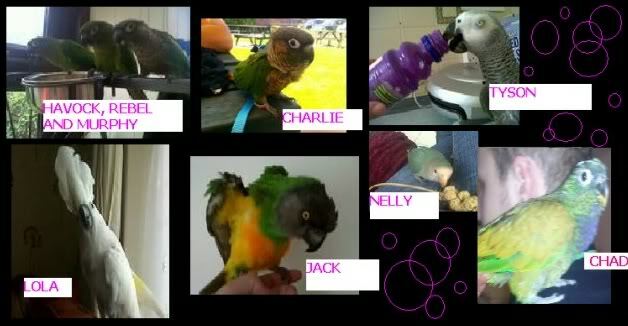 It is really nicely written and poor parrots before you "saved" them! What is Aspergillus? How they get this from....? Aspergillosis is a respiratory disease of birds caused by the fungus Aspergillus, which is found almost everywhere in the environment. A. fumigatus is the most common species of the fungus to cause disease, although A. flavus, A. niger, and others can also cause problems. Aspergillus grows readily in warm and moist environments. The microscopic spores of the fungus become airborne, and poor ventilation, poor sanitation, dusty conditions, and close confinement increase the chance the spores will be inhaled. Usually, the fungus does not cause disease, however, if a bird does not have a healthy immune system, it can cause illness. Predisposing factors include other illnesses, stress, poor nutrition, poor husbandry or unsanitary conditions, another injury to the respiratory system (e.g. ; smoke inhalation), and prolonged use of certain medications such as antibiotics or corticosteroids. The combination of the number of spores in the environment and the presence of predisposing factors determine which birds are most at risk of disease. Aspergillosis appears to be more common in parrots and mynahs than other pet birds. What are the signs of aspergillosis? Aspergillosis can follow one of two courses - acute or chronic. Birds with acute aspergillosis have severe difficulty breathing, decreased or loss of appetite, frequent drinking and urination, cyanosis (a bluish coloration of mucous membranes and/or skin), and even sudden death. The fungus generally affects the trachea, syrinx (voice box), and air sacs. The lungs may also be involved. Diagnosis is generally made through a post-mortem examination. Chronic aspergillosis is much more common, and unfortunately, much more deadly due to its insidious nature. The bird may not become symptomatic until the disease has progressed too far for a cure. The respiratory system is the primary location of infection. White nodules appear and ultimately erode through the tissue, and large numbers of spores enter the bloodstream. The spores then travel throughout the body, infecting multiple organs including kidneys, skin, muscle, gastrointestinal tract, liver, eyes, and brain. Respiratory symptoms will be the first to occur but will depend on the location of the greatest areas of colonization. Difficulty breathing, rapid breathing and/or exercise intolerance are common. If the syrinx (voice box) is involved, a change in voice, reluctance to talk, or a "click" may occur. Nares may become plugged or you may see a discharge. Eventually, severe respiratory compromise may kill the bird. Other signs and symptoms will vary, depending on the other organs involved. If any portion of the central nervous system has become involved, the bird may have tremors, an uneven or wobbly gait, seizures, or paralysis. With liver involvement, a green discoloration to the urates may be seen, and the veterinarian may feel an enlarged liver. Generalized, non-specific symptoms can include loss of appetite leading to weight loss, muscle wasting, gout (painful, inflamed joints due to urate deposits), regurgitation, abnormal feces or diarrhea, excessive urination, depression, and lethargy. Spores can penetrate fresh or incubating eggs and will kill the embryos. Aspergillosis can be very difficult to diagnose since the signs of disease mimic those of many other illnesses, especially in the chronic form. The veterinarian will need a detailed history of the course of the illness, and an accurate description of the diet and husbandry of the bird. Radiographs, a complete blood count, and a chemistry panel may help support a diagnosis. Endoscopy can be used to view lesions in the syrinx or trachea, and a sample can be taken for culture and microscopic examination, and possibly PCR testing for the presence of Aspergillus, which can confirm a diagnosis. A diagnosis can also be supported by a specific blood test panel to look for aspergillosis. Sometimes, however, the test can be falsely negative or falsely positive, so the tests must be interpreted in combination with the other findings. Surgery may be performed to remove accessible lesions. Antifungal drugs such as itraconazole and amphotericin B may be administered orally, topically, by injection, or nebulizing, depending upon the drug. There are several reports that itraconazole may be more toxic to African grey parrots, when compared to other species. Therapy needs to be continued for weeks to months and more than one antifungal drug may be used. Supportive care such as oxygen, supplemental heat, tube feeding, and treatment of underlying conditions are often needed. Unfortunately, the prognosis is always guarded. The importance of good husbandry and diet to prevent outbreaks of aspergillosis cannot be overstated. Keep your bird in a well-ventilated environment. Clean food and water dishes every day. Replace substrate (material lining the cage bottom) regularly. Remove your bird and thoroughly clean cages, toys, perches, etc., at least once a month. Pay attention to good nutrition, offering the right combination of fruits, vegetables, pellets, and only a sprinkling of "treats." Essentially, you want to do everything you can to alleviate stress in your bird's life and provide a scrupulously clean environment. Oliver has sort of remained stable at the moment, it`s the scarring in his air sacks which is the problem for him. We just take each day at a time, give him as good a diet as we can with lots of treats, toys, and company of the other birds. Glad you enjoyed meeting the staff! hi all, i am kay, nice to join you!! x i have a blue/gold macaw, lesser sulphur, blue crown conure, galah, rainbow lorie, and a mixed aviary with budgies, finches, canaries, red-rumps,cockatiels, rosellas,lovebirds, doves, and a wood pigeon with one wing.! Hi Kay great to have a new member. Your have plenty of birds to keep you on your toes!!! Helloi and welcome Kay you have your hands full, look forward to tales and pis of your flock. You certainly have a great mixture there! Photos please! Hi and Welcome Kay, look forward to hearing more of that large flock of yours. Hi kay and welcome!can't wait to see pics you don't see many people with lories, is yours tame?they've got a brill lorikeet enclosure at longleat, we spent ages in there!